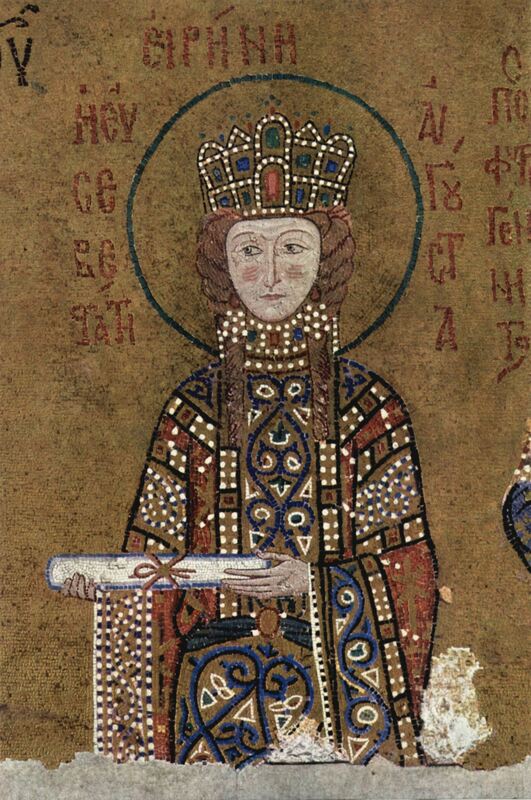 Irene was Byzantine empress consort by marriage to Leo IV from 775 to 780, Byzantine regent during the minority of her son Constantine VI from 780 until 790, and finally ruling Byzantine (Eastern Roman) empress from 797 to 802. She is best known for ending Iconoclasm. Although it is often asserted that, as monarch, Irene called herself "basileus" (βασιλεύς), 'emperor', rather than "basilissa" (βασίλισσα), 'empress', in fact there are only three instances where it is known that she used the title "basileus": two legal documents in which she signed herself as "Emperor of the Romans" and a gold coin of hers found in Sicily bearing the title of "basileus". In relation to the coin, the lettering is of poor quality and the attribution to Irene may be problematic. She used the title "basilissa" in all other documents, coins, and seals. In 802 the patricians conspired against her and placed Nikephoros, the minister of finance (logothetēs tou genikou), on the throne. Irene was exiled to Lesbos and forced to support herself by spinning wool. She died the following year.